Most of the runways we rent for fashion shows are 4' wide by 24' long, and longer. If there are two or more models passing side by side, we recommend an 8' width. Some modeling runways are "T-shaped," providing an additional back-and-forth area for the models, podium, themed decor, lights, or staging area. If your runway is 8 feet wide we can add a rounded front that will make the runway look amazing. We can also provide white skirting so you can use lighting under the runway for an amazing look. Our stage panels come in 4' x 8' panels, so you can design your modeling runway in any multiples of that: 4' x 8', 4' x 16'...4' x 24'; 8' x 16'...8' x 24' etc. The height of the modeling runway needs some thought. If your audience is going to be seated directly next to the runway on either side, we recommend a minimal height, somewhere between 1' and 2' tall. You want the models to be high enough to see, but not too high that your audience gets a kink in their necks from looking up so high or that your models need to worry about making sure their skirts are long enough! 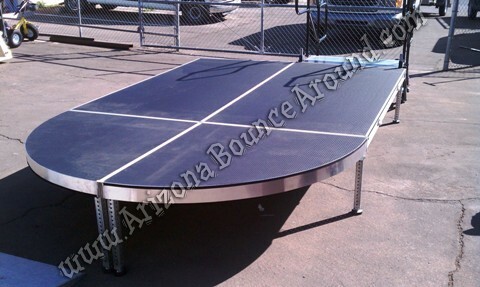 Each runway panel rents for $60 and will include you choice of 12" or 24" height with black skirting all the way around. 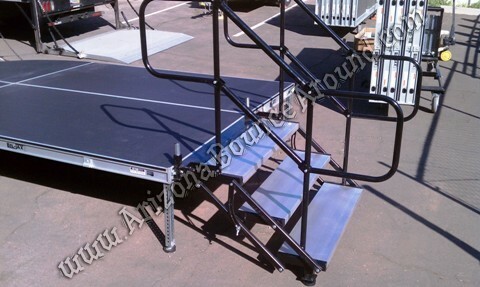 Stairs with hand rails for 12" or 24" stage can be added for $49 and not really needed for 12" stages but can be added if you desire. 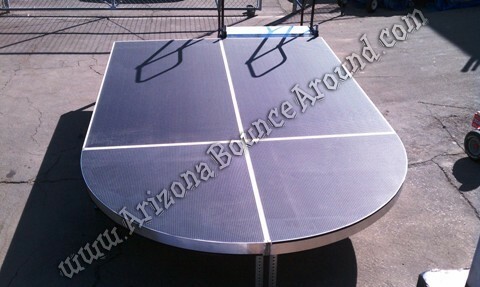 • Our runway panels have a rubberized non slip coating bonded on the top surface that looks great. Most other runway rentals are covered with black Astro turf or carpet. • Our runway rentals are professionally made to be used as a runway and are not tables with short legs clamped together. • Our stairs come complete with handrails at no additional charge. The runway above is a 20' long 8' wide runway in front of a 24' wide 12 deep stage. 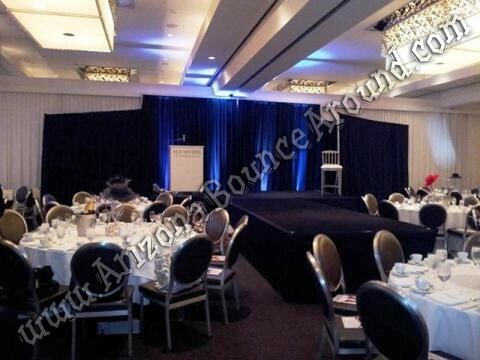 The pipe and drap and uplights were added as an option and not included in the runway rental price. The 2 photos below show the optional rounded front. The top photo is 4' wide x 32' long runway with a 24' wide x 12' stage.